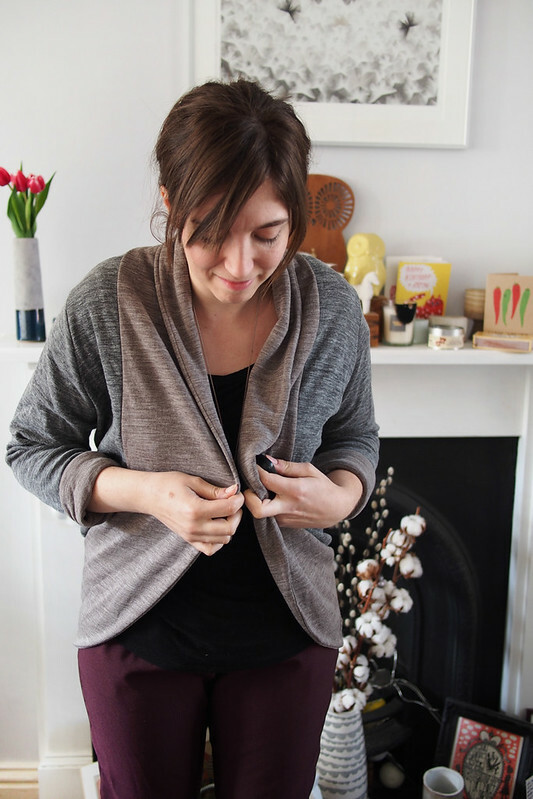 This is one of those makes where I feel like a bit of a fraud taking any sewing-skill credit for it: the beautiful fabric and pattern did all the work for me, and I’ve ended up with an effortlessly rather gorgeous cardigan in no time at all. Fabric fangirling first: this is a delicious double-faced wool jersey from a little midweek splurge I had at the Cloth House a couple of weeks ago. Honestly, it’s a good thing I don’t work in Soho or I’d be perpetually broke from spending all my £££ in Cloth House; they have the dreamiest stock across their two Berwick St shops. I’d been going in and petting their wool jerseys for a while and finally bought this one; I think it was around £16 a metre. I ran it through a gentle wool machine wash before cutting and lay it flat to dry. 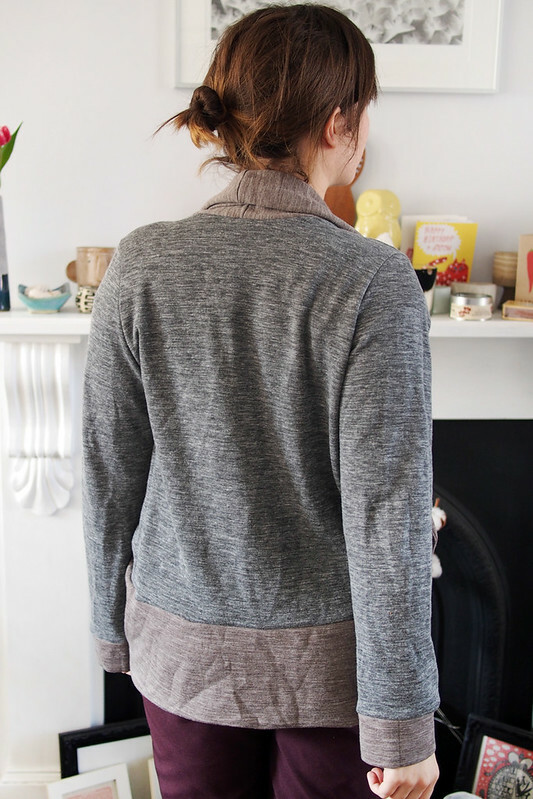 It was a dream to work with, and feels gorgeous to wear: soft and snuggly and as warm as you’d expect from wool. In this early spring weather I can wear it as a replacement for a light jacket. I was looking for a slouchy, shawl-collared cardigan pattern to show off the reversible fabric. 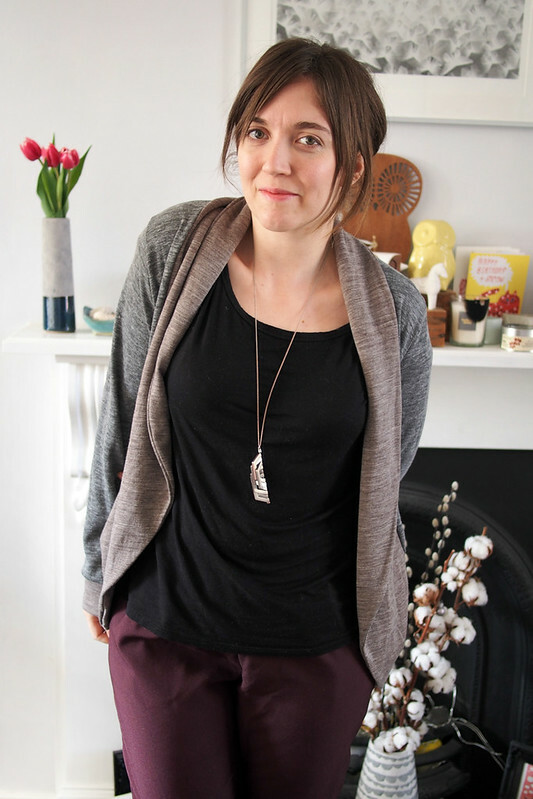 There aren’t many cardigan sewing patterns out there, but the Julia Cardigan, a PDF download from MouseHouseCreations available on Etsy, fitted the bill nicely. I was really happy with the pattern itself: the printout is nice and tidy and it comes with very thorough photo instructions bundled in the PDF. It’d be a great pattern for beginners to learn the ropes of knits and construction techniques. 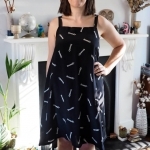 From putting together the pattern to finishing you could make this in one session: the most time-consuming part is pinning on the long circular collar evenly, otherwise it’s just a few speedy overlocked seams. (I swear it doesn’t really look that creased all the time, it had been folded away in my bag as it was too warm out!) Sizing-wise I went for the Large based on my hip measurement, and I’m glad I did as it’s quite narrow across the lower back and I wouldn’t want it any snugger. The side seams still pull to the back a bit, but I think this is part of the design: I may widen the back pieces next time to fix it. The only adjustment I did make was to shorten the sleeves by 2″. The pattern includes various sleeve lengths and options for a regular hemmed edge or the hemless option I chose: you use cuff bands and a doubled-over shawl collar band to finish all the raw edges. Luckily I juuust had enough fabric to cut both faces of the collar (using the reverse of my fabric facing out for a contrast), and I love the seamless finish it gives. The only other thing I’d do differently next time is to try adding side seam or patch pockets. Err, I dunno what my face is doing here, but look at those tidy guts. I could almost even get away with wearing it inside out. I wove the few loose overlock threads neatly away and added a drop of fray check to keep them in place. 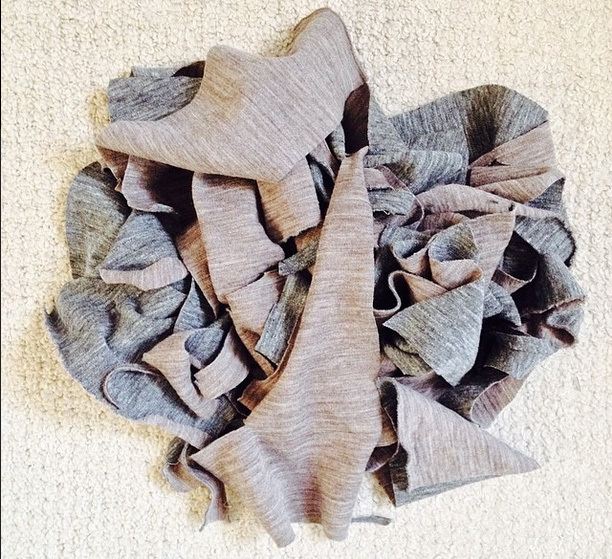 You know a fabric is truly lovely when you can’t even bear to throw away the tiniest of leftover scraps! Maybe I’ll make some little stuffed cat toys with them. 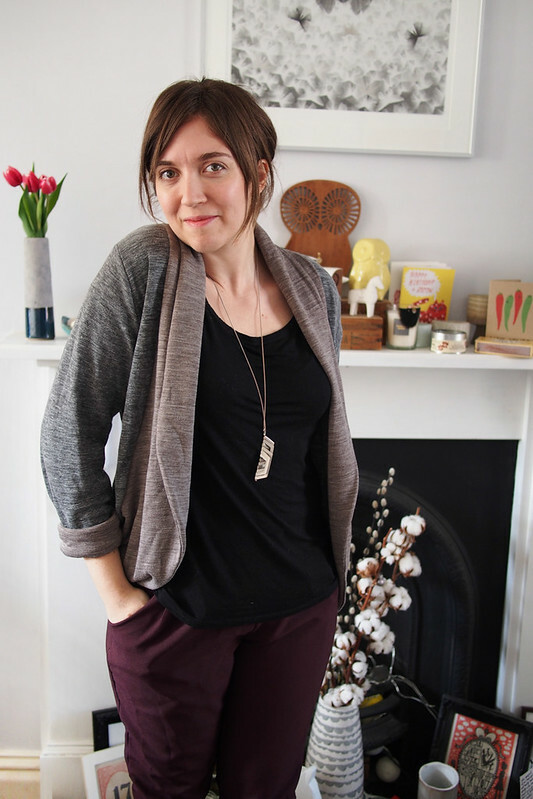 What a lovely suggly cardi – it looks great on you. 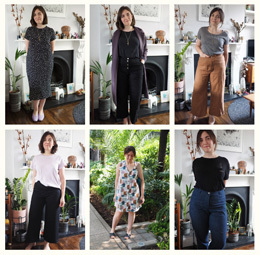 I bumped into you very briefly at a GoldHawk Road sewing bloggers meet at the end of last year and caught the underground back into London with you and Kathryn (I had a massive bag of fabric I’d bought for a school project). Anyway – you have some fab home-sewn makes on your blog. Great stuff!! i just made this same pattern last weekend! i love it so much, the doubled over collar/band is nice and cozy. i like how you used the contrast side, looks so awesome! This is so lovely! I have some wool jersey that I’ve been hoarding for the longest time, and I may have to copy you and make one of these. It looks so snuggly and nice! I can see it on you! It’s a great pattern. Ooh great cardi! I’ve got some wool jersey in my stash that could be perfect. This looks like such a good staple. I always forget that it’s possible to make cardis like this and that I don’t need to be shelling out $ on the high street. Yours is cooler, anyway. Do you find that the collar band is bulky or is it ok? My wool jersey is medium weight I guess. It’s not that bulky, it’s supposed to fold over itself and drape anyway. 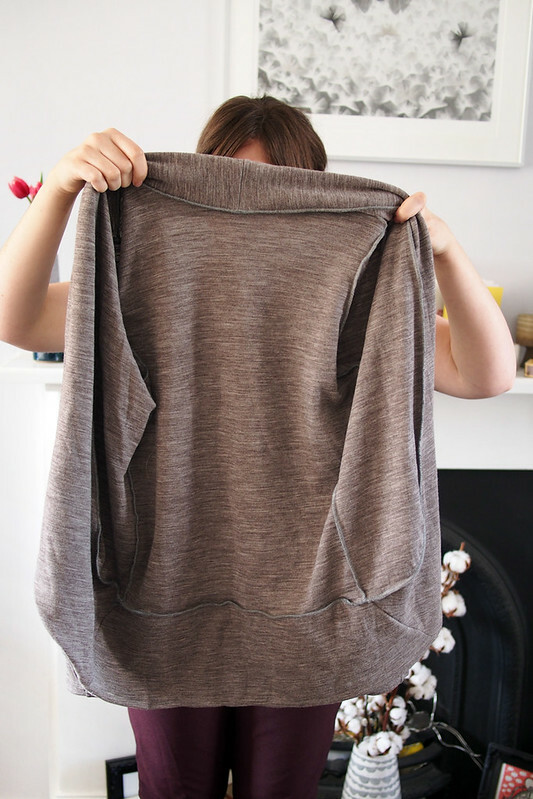 You could probably make it narrower quite easily if you preferred, or just hem the edges. This is so gorgeous & I can totally see why this is a favourite make – I want to wear it all the time too! 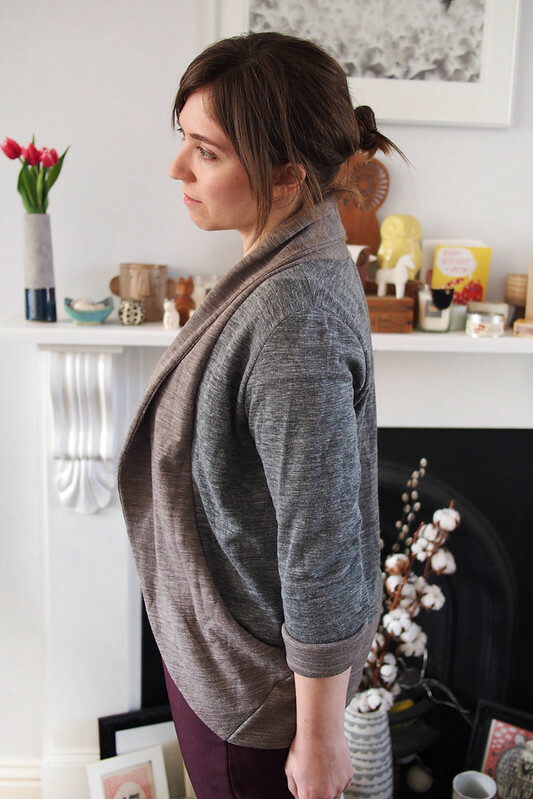 I’ve had this pattern bookmarked for ages as have a shop bought cardigan like this I’ve worn to death – how much fabric did you use? I just fitted it into 2m, I think the recommendation for the size large is a little more than that. You could use less by having shorter sleeves or a non-doubled over collar. cosy but chic! very envious of your fabric wool jersey sounds fab. I can see a day in London fabric shopping coming soon – when the kids are back at school. It looks very snugly and chic. Glad you lashed out on something super swish – you’ll get so much wear out of it I’m sure. Lovely!!!! And perfect timing! I’ve just splashed out on some divine heavy knit from Tessuti and was browsing for a relaxed jacket pattern worthy of it – this is gorgeous. Really love this Katie! 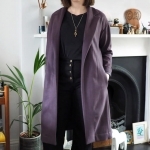 It’s exactly the style of cardigan I like and I think I might have to make me a Julia as I can see me wearing it to death! I luuurve Cloth House too! Thanks Ami! 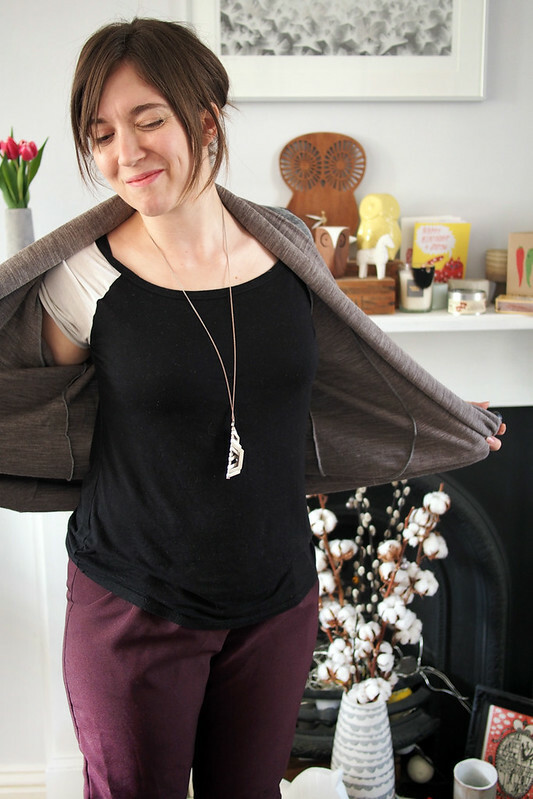 I’m a fan of your blog – this would look lovely on you, and it’s super comfy. I’ve been glad for the snuggliness lately too!